The organisation of Belgian Bowl XXXI has been taken on by the Limburg Shotguns for the second time. 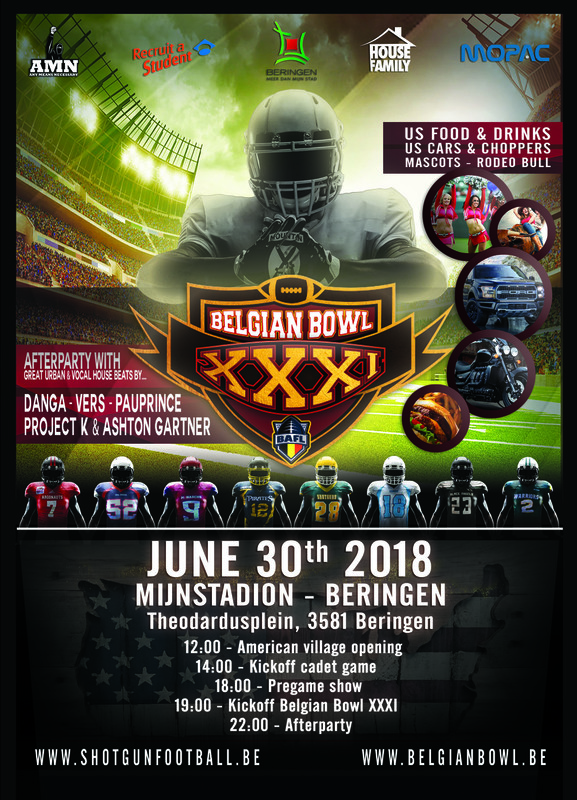 They are in full preparation to make this a great day, not only for the players and teams playing in it, but for the entire American Football community in Belgium. The Mijnstadion in Beringen has a total capacity of over 5000 people and is sometimes used by the U19 Red Devils National Soccer Team. The day will be filled with an all-american atmosphere with food, cars, cheerleaders and live-acts. Closing of with an outdoor afterparty with some great artists! Expect the best urban & vocal house beats! The Limburg shotguns offer the BAFL team an special opportunity for the event. Regular tickets will be available online for 15 euro, but for the Belgian Teams we want to do something special! All the teams that are willing to sell tickets will receive 25 or 50 tickets, they can choose. For teams that will sell 25 tickets, we make an invoice of 300 euro. Which means that you can earn 75 euro. For teams that will sell 50 tickets, we make an invoice of 500 euro. Which means that you can earn 250 euro. If you can not sell 25 or 50 tickets, no problem at all! We hope that all the teams just show their colours at the event, which will be great publicity for us all! This offer will be based on the sales of paper tickets, NOT THE ONLINE VERSION. Following the input of Belgian clubs at the general assembly of 24/02/2018, BAFL scheduled a series of meetings. At the last meeting of 14/4/2018, following items were put on the agenda and discussed. We take great importance in keeping all our members updated on our progress. Due to the recent weather conditions, the FAFL DII games in Izegem : Ghent Gators vs Waasland Wolves and Leuven Lions vs Izegem Tribes are postponed to a later date. The schedules will be updated as soon as the new date has been fixed. The first game of the national Elite Championship Waterloo Warriors vs Brussels Black Angels had to be relocated and will be played in Anderlecht, Jesse Owens Stadium. Date and time remain unchanged. The YTDP is a player development program run by the BAFL Youth Committee for players aged 13 to 19. All players holding a valid licence with a Belgian team are welcome to join. The General Assembly of the National Federation will be held on Saturday 24, 2018 in Dilbeek, Hotel Gosset, as from 14:00. In order to enable the teams to comply with the regulations with respect to the provision of club-team officials, the BAFOC will organize one last clinic before the start of the championship. This clinic will be held on Sunday January 14, 2018 in Grez-Doiceau (Fighting Turtles field). We remind all teams who did not yet comply with the regulations that this is the last chance to attend a clinic in order to be eligible for officiating in the senior season. Today in Puurs, the Brussels Football Academy’s players grabbed their second Junior Championship title. The game opposing the Brussels Football Academy and the Ostend Pirates ended on a 52-00 score with 1:10 remaining on the clock in the 4th quarter. The team led by coach Stijn Debacker had already won the championship in 2017. After discussion with the teams qualified for the 2018 Elite Division championship, the schedule has been finalised and is now avalaible online. Scroll down the results and standings menu : National Elite Division for more. – Changes of rules for next senior and junior season. – Basic topics explained and reviewed. Reminder: It is mandatory for new club team officials to participate in this clinic to be able to join the crews during the upcoming season. – Rules changes for next senior and junior season 2018. – Advanced topics explained and discussed. The BAFL (Belgian American Football League) is the governing body of American Football & Flag Football in Belgium.